Copyright: Contestants will retain the rights to their photographs. However, contestants grant Tamron USA, Inc. and its agency, unlimited rights, for 18 months, usage of the winning image, the winner's name, photo, and likeness in any advertising/promotion efforts by Tamron USA, Inc. 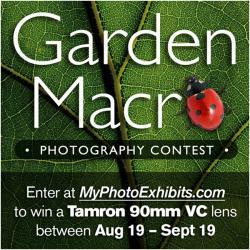 The winning exhibit will be featured in Tamron’s newsletter and website. The winner will also receive Tamron SP 90mm F/2.8 Di VC USD 1:1 Macro (model F004), $749 value, winner’s choice of Canon, Nikon or Sony mount. You can submit 8-14 images as they relate to topic of Garden Macro photography. Online submission of digital photographs via the website or on a CD by post. Only two exhibit entries per person (8-14 images per exhibit). Image requirements: No manipulation beyond color correction, conversion to black & white, brightness and contrast. No HDR or panoramas accepted.